$2.99 to $159.99 & FREE Shipping on orders over $59 $35. Released in 2012, this is one of the brand new hops from Germany that is making craft brewers around the globe take notice. Mandarina is extremely limited and in high demand for all kind of beer styles. It is being used in IPA, Saisons, you name it. It is known for having a fruity, citrusy, Mandarin Orange flavor, hence the name. It is a daughter hop of Cascade grown in Germany and is also said to slightly enhance sweetness. We are thinking IPA but since this hop is so new we would love to see your reviews. I'm experimenting with a pineapple beer. I read the Mandarina hops add a flowery, spicy and citrus-like flavor with an orange bouquet. I'm going to dry-hop with it. Wish me luck. Great service and arrived quickly. The hops seemed very fresh. Really happy with the large inventory offered. Love love love. 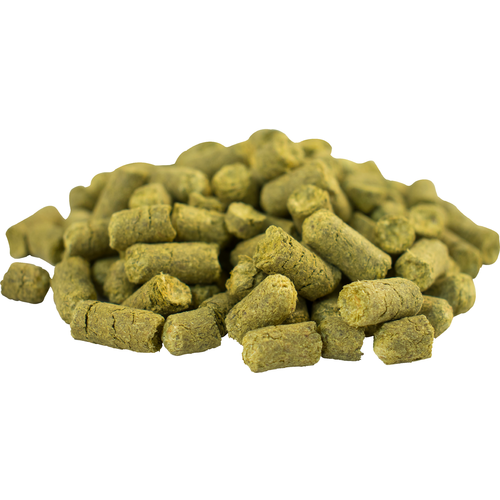 It's perfect for a single hop lager, lends great orange flavours. I dry-hopped a pineapple wheat and these hops and it gave a nice flavor and fragrance. Used in a Red Ale with Centennial for Bittering. Paired up with Amarillo for Flavor and Aroma additions .... excellent flavor combination! When I read about these hops, I envisioned a blonde ale that used them for bittering and flavor, along with bitter orange peel, sweet orange peel, and orange blossom honey added late in primary fermentation. I started with a blonde ale recipe, tweaked it a little to my taste, and brewed it. It turned out perfectly, so I entered it into the 2017 Ohio State Fair Homebrewing Competition. It took second place against 24 competitors in the Fruit Beer category. I couldn't be more pleased. I'll definitely make the beer again! Used this in a wheat ale. Half an ounce for bittering and half an ounce for flavoring. Turned out great. I use this hop only during the last 20 minutes typically as a late hop addition or aroma addition. I have not yet used it for dry hopping. It's good for adding the more mellow and tangerine like citrusey flavors to beers such as wheat beers, hefeweizens, IPA's, Belgians, citrus/tropical fruit beers, and Pale Ales. I imagine it can be used for other styles too since it has a fairly smooth flavor. Citra is a bit more pronounced and sharp in it's characteristics and bittering than Mandarina Bavaria. I often use it with Citra, and also find that it pairs well with Spalt, Sprisselspalt, Saaz, and Centennial. A great hop overall. Not to be used to as the primary bittering hop, but great as a flavor and aroma hop. I got a nice sweet orange peel type flavor in an APA. Nice aroma too but not as strong as some of the US or Pacific fruity hops.